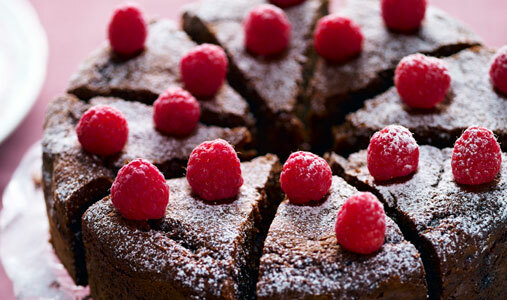 Show your loved one how much they mean to you this Valentines with this double chocolate pud. It takes 50 minutes to bake and costs 85p per serving, meaning it’s only fair they cook the main course! 2. Put the cocoa powder and boiling water into a large bowl and mix well to make a paste. Add the remaining ingredients and beat again until combined. This can also be done in a food processor, but take care not to over whisk. Divide the cake mixture between the prepared tins. Bake for about 25-30 minutes, or until well risen and shrinking away from the sides of the tin. 3. Meanwhile, for the icing and filling, measure the chocolate and cream together in a bowl and stand the bowl over a pan of simmering water for about 10 minutes, or until melted. Stir from time to time. Set aside and leave until cool and almost set. 4. Once baked, remove the cakes from the oven and allow to cool completely. Next fill the cakes with half of the icing and spread the remainder on top. Sprinkle with raspberries, dust with icing sugar and serve in slices. Love this indulgent double chocolate pudding? Why not start your meal with a tasty steak dish?